The GSE Scale Systems Porta-Tronic 800 Series was designed for mobile weighing in light to medium capacity applications. Smooth, portable operation maximizes efficiency when weighing in multiple areas. 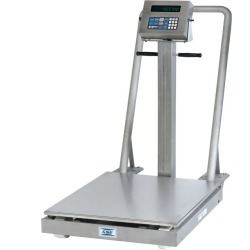 Designed for portable weighing applications, the GSE Porta-Tronic 800 provides easy mobility for use in multiple locations. The stainless steel weighing surface is a standard feature. Customers can choose either a powder coated carbon steel or a stainless steel base to provide the durability needed in light to heavy industrial environments. The Porta-Tronic 800 was designed for mobile weighing in light to medium capacity applications. Smooth, portable operation maximizes efficiency when weighing in multiple areas. Numerous options provide flexibility for custom applications. 198810-19252501 PT 810C W/S.S. Swivel Casters, 500 NSF approved Platform size 19" x 25"
198810-19252102 PT 810C W/S.S. Swivel Casters, 1000 NSF approved Platform size 19" x 25"